A cat who once ate a whole cheesecake has been named Scotland's top slimmer by a pet charity after losing almost a fifth of its body weight. Chester, from East Lothian, was more than 50% above his ideal weight at 7.6kg (1st 3lb) before slimming to 6.3kg (1st) over six months. The cat was so big his owners thought there was an underlying medical problem. However, experts said too much food and a lack of exercise were the problem. Chester was enrolled in the fit camp run by the PDSA animal charity. Owner Lisa Gilmour said: "It's made such a big difference to Chester - he's a completely different cat. "Before, he would sleep all the time and do his best to avoid us. But now he joins in and shows much more interest - he greets us at the door and comes to us for cuddles. "He is much happier and no longer looks miserable. He runs rather than plods - it's done him the world of good." Every year the PDSA helps the UK's fattest pets battle the bulge in a six-month diet and exercise challenge, specially tailored and overseen by its vets and nurses. Pets losing the most percentage body weight are declared winners. Chester was top in Scotland after losing 17% of his weight but missed out on the overall UK prize to a King Charles spaniel and Labrador in England, which lost 25% of its weight. Another Scottish cat - Elvis, from Clydebank - was also praised by PDSA for losing 14% of its body weight. PDSA vet Olivia Anderson-Nathan said: "It has been hugely rewarding to see Chester and Elvis's weight decrease over the last six months thanks to their new diet and fitness regime. "Their success is testament to the hard work of their owners and our PDSA veterinary teams. 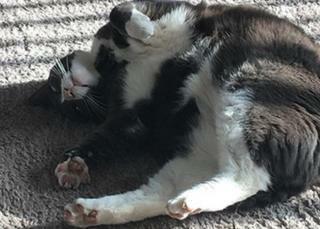 "Pet obesity is a growing issue that affects millions of UK pets. Around 40% of dogs and cats in the UK are estimated to be overweight or obese."